"He's amazing. In one week, he can turn things around. This is a youngster who can dunk a basketball, throw a football a mile and bench press 225. He's all lean muscle. We do core work, but Za'von is the kind of kid who will have eight-pack abs without doing one sit-up." 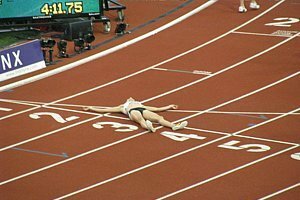 After all, this was a runner who as a sophomore ran the second fastest high school 4 x 800 relay leg ever, a 1:47.99 anchor at the 2009 outdoor nationals. - Liverpool high school coach Justin Block talking about high school sensation Za'von Watkins. If you don't know who Watkins is, it's time you learn who he is, as he really is exceptional. The HS quarterback, who split a 1:47.99 in 10th grade, really can get in shape incredibly fast. This year because of a concussion in football, he didn't start running until December but dominated both the US Open and Millrose miles. We saw him run a mediocre 4:28 for 1,600/36.43 for 300 on January 7th and thought, "That's the one everyone is talking about?" A month later, he's a totally different athlete. This photo here of Watkins is truly incredible. We love how he a) Knows how to celebrate and b) Looks like a football player. If you couldn't make the olympic team in the U.S. but you could in another country, would you switch citizenship? The day cross country died? 90% Of All Triathletes Make More Than $100,000 Per Year This is good news for Lukas V fans as it's official - the African athletes have little chance. It's also worth noting that triathletes spend over $2,000 per year on the sport but less than 5% of that on running shoes. Tom Jordan On Kenyan Olympic Trials in Eugene: "Nothing has been confirmed yet." "But the (Kenyan) men's and women's 10K are promising." Eliud Kipchoge 8:07.4 2-Mile Defeats Mo Farah This was a tremendous race with 4 guys, Kipchoge and Farah plus Uganda's Moses Kipsiro and Tariku Bekele, battling on the final lap. Kipchoge, the 2003 World 5,000m champ, got the win and World Leader. If you think this makes him the best Kenyan right now, think again. Kipchoge was 4th in the 3,000m in Germany last weekend. In other action, Genzebe Dibaba blasted another fast 1,500 (4:01, Anna Pierce 4:11), Liu Xiang ran a PR to beat Dayron Robles, Jamaica's 8th-fastest 100m man last year, Lerone Clarke, ran a national record in the 60 ahead of Asafa Powell, Meseret Defar ran 8:31.56, Jessica Ennis had 2 PRs and a world best in the hurdles, and Bernard Lagat was well beaten at 1,500m. 8,000 fans in attendance. This is what track and field needs. "Plastic Brit" Shara Proctor Breaks UK Indoor LJ Record And Ignores Criticism She's from Anguilla, which is not recognised by the IOC, so she would not be able to go to the Olympics if she competed for them. Birmingham On The Boards: why was uceny dq'd?? Christophe Lemaitre Wins 60m At French Meet In 6.59, But Says Will Not Compete In World Indoor Champs France's Renaud Lavillenie set world lead in PV with 5.93m; Jamaican Patricia Hall ran 200m WL of 22.88. Victor Kipchirchir Wins Close Race At Unep Half Marathon In 1:00:27 Over Kamiu Wanjiku's 1:00:28 Mercy Chemta won the women's race in 1:12:51. The article doesn't say much about it, but the more interesting race if they ran hard would be the 5k, as it included Paul Tergat and Patrick Makau along with other past elite Kenyans. Good Story: Former Rugby Player Thom Evans Running Fast In The 60m 2 Years After Spinal Injury That Almost Killed Him "I thought I would die there on the grass." LRC Mary Keitany & 17-Year-Old Dennis Koech Win 2012 RAK Half Marathon Windy conditions slowed down the winning times considerably (60:34 and 66:42), but Mary Keitany did still produce the 8th-fastest 13.1 in women's history as a 17-year-old Kenyan dispatched the 2012 world leader and a 2:03 marathoner in the men's race. *IAAF Recap Geoffrey Mutai Withdraws With Sore Foot And Then Fast Times Are Blown Off Course The IAAF is saying that Koech is 18. Ken Goe Thinks That Bring Back The Mile Idea Isn't A Good One We disagree with Goe's overall argument but agree with him here: "The rest of the world isn't going to give up the metric system because it's uncomfortable for the U.S. geriatric set." The thing that all BBM detractors seem to don't get is - we aren't saying BBM will save the sport - we're just saying it can only help and won't hurt. The sport needs to make every incremental improvement it can. As Meb said Thursday, "Well, in running or track and field there's three prime events, there's the 100 meter, the mile and the marathon." Bolt Update: Glen Mills: "Usain Bolt Is Not Injured" According to this, Bolt has scheduled visits with "Healing Hans" several times a year for treatment for his scoliosis, so this is just a routine thing. Mills could have avoided the speculation by saying that from the start instead of trying to cover it up with a faux "business trip." LRC Rupp's Record Vs. Lagat's Record, Down Goes Rono, Miles Batty, Chris Derrick And Ryan Hill?, Plus Katie Flood, Marathoning, White Dudes In The 4 X 400, Some Canadian Coaching Advice And More Just in time for Valentine's Day, the track and field world came afire with some sizzling action and records galore. We got the meat (what you expect) and the potatoes (what you wouldn't expect) of the track and field world covered. We guarantee you won't be disappointed. If you are, complain here. Interesting Read: Patrick Makau Speaks On Being Self Coached, His Half Marathon Loss In Spain, And His Two Newborn Twin Sons He gives great training advice, as he talks about listening to his body and says that he could have won in Spain, but he decided to save himself for other things ahead. Good read from Mutwiri Mutuota. Recommended Read: The Telegraph's Ian Chadband Catches Up With Yohan Blake After His 2012 Season Opener - Blake Still Plays Cricket Every Sunday With Glen Mills' Blessing Can anyone in America imagine a college coach letting a sprint star play pickup games on the weekend? Yet Blake, who comes from a tough background, is super-fast. "I wasn't born with a golden spoon in my mouth; it was a really tough life. So many times, we had no money to even get to school. I'd have to find empty beer bottles to sell and spent hours carrying water on my head because we had no water at home. It gave me strength which helps me today." *Meet The German Doctor Bolt Went To See Instead of Running 400m Last Week - The Doctor They Call "Healing Hans" In December, ESPN did a long profile of Dr. Hans-Wilhelm Muller-Wohlfahrt - the doctor to the stars - including 5 of the 8 Berlin 100m finalists, plus people like Bono. He swears by Actovegin injections - calf's blood. 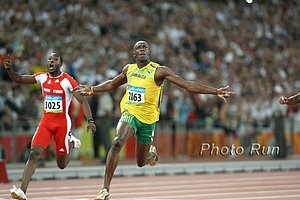 Previous: Bolt Doesn't Run 400m Because He Has "Business Trip"
*Coach Says He's Stunned That People Think Bolt Is Hurt But Yohan Blake Admits He Went To Get A "General Checkup"
LRC Galen Rupp's American 2-Mile Record Is Highlight Among 5 World Leaders Pre-race, we pondered if this was the best men's indoor mile in the US since LetsRun.com was founded and it lived up to the hype, as Silas Kiplagat edged Caleb Ndiku in a world-leading time, but it was Galen Rupp, running to honor the late Geoff Hollister, who stole the show with an impressive American record at 2 miles. In other action, Brenda Martinez took on some of the world's best in the mile, Jamaica's 8th best sprinter beat all the Americans, and Tianna Madison (a long jump world champion most of you have forgotten) shocked VCB and Allyson Felix in the 60m. IAAF Recap Says Salazar "waived a post-race workout" as a "reward" for the record, but we doubt either Salazar or Rupp would skip a workout unless it made sense. Was This the Most Stacked Indoor Mile in the US Since LetsRun.com Was Founded? 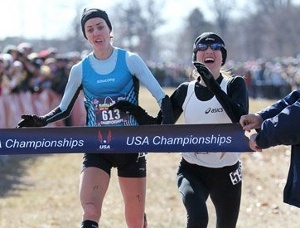 Molly Huddle Celebrates Too Soon, Sara Hall Wins XC On Lean, Bobby Mack Beats Aaron Braun Great races in the chill of St. Louis, as Molly Huddle and Sara Hall battled to the line. Huddle put up her hands thinking she won, but Hall leaned and got the win. Photos here. On the men's side, Mack pulled away from Braun the final 600m. More coverage here. Photo finish photo here. Is Bobby Mack the Jeremy Lin of Running? Why does Sara Hall still compete? Duusseldorg Results (Nixon Chepseba 3:35, Thomas Longosiwa 12:58, Adam Kszczot Crushes Boaz Lalang, Lolo Jones Wins Hurdles, Jimmy Vicaut Wins 60) Dayron Robles got beaten by Kevin Craddock of the US. Logosiwa was Kenyan Champ in 2007 and ran 12:51 that year. He was 6th at Worlds last year. Geoff Hollister, An Original Nike Employee And Former University Of Oregon Track Runner, Dies At Age 66 Hollister was a legend at Nike and the sport of track and field and Nike wouldn't be the same without him. He also was the producer of Fire on the Track, which was voted the best running movie ever on LetsRun.com. Members of the Oregon Project wore special singlets at NB supporting him as he was critically ill at the time. LRC Abdi Talks Olympics As He's In Chicago For Launch Of Registration For 2012 B Of A Chicago Marathon Abdi talked to LRC's Wejo via phone. Abdi discussed the Chicago launch, his track plans, his training group, and gave us an update on drug cheat Martin Fagan. Registration was over 18,000 as of 4pm. 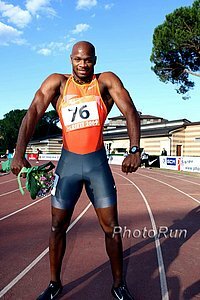 Asafa Powell To Race Usain Bolt In Rome On May 31st Last year, the two also raced in Rome and Powell was only .02 behind Bolt. Ivet Lalova Wants Medals At European Champs This Year Don't known Lalova? She's an LRC interview sensation and the 2nd-fastest European ever at 100m. Ex-Scottish Rugby Player Thom Wales, Who Was Nearly Killed On The Pitch Two Years Ago With A Broken Vertebra, Is Back As A 60m Man Now He's not all that fast (7.23) but it's an amazing accomplishment. Interesting Read A Look Back At The Last Time London Hosted The Olympics: The 1948 "Austerity Olympics" The 1948 Games were a huge success but put on with a tiny budget of just £760,000. Competitors were given bed linens but expected to bring their own towels. "Today, when seven years are needed to organise a multibillion-pound Olympics, it is fitting to reflect on these 'Austerity Olympics,' in which so much was achieved, in so little time, with so little money. The Games were an extraordinary occasion, a true celebration of victory after dark times, and one of the most inexpensive and unpretentious Olympiads of the twentieth century." We Aren't Making This Up: Weighted Shoulder Throw To Become Javelin Of Indoors? 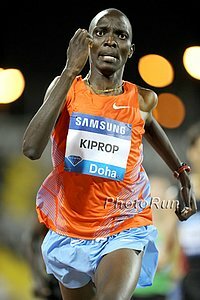 Kiprop 1:45.9, Rudisha 45.61, David Torrence 3:35.6 Wins The Australian season got underway in full force with the two best mid-distance runners, Olympic and World 1,500m champ Asbel Kiprop and World 800m champ David Rudisha, both dropping down in distance. Rudisha ran 45.61 at 400, while Kiprop got the 800m win in 1:45.9. Kiprop dropping down let American David Torrence win the 1,500 in 3:35.6. World hurdles champ Sally Pearson did the hurdles/200m double. Nick Symmonds did not have his kick and was a well-beaten 6th in 1:47.44, which is a pretty good opener. LRC Track Talk Live From Kenya LRC Employee #1 talks about meeting Kiprop and Rudisha. Did you know Rudisha was doing the decathlon for a while? 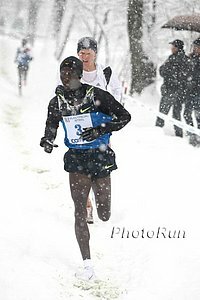 Bedan Karoki, Joyce Chepkirui Win The Toughest XC Race On The Planet Karoki is the Japanese-based athlete who won the Stanford 10,000m last year. Chepkirui had a breakout year in 2011, running 30:38 on the roads (prior to last year, she had never broken 33 minutes) and ran 31:26 to win the Zatopek 10k. World and NYC Marathon champ Edna Kiplagat was 3rd, while former World XC Champ Joseph Ebuya was 49th. *Over The Flu: Vivian Cheruiyot To Race World's Best 10km This Saturday She missed out on Birmingham with the flu. *Pre Classic Update: Meet Director Tom Jordan Comments On Kenyan 10,000m Trials Being At The Pre Classic Says it looks "promising" but not "confirmed yet." He only spoke of the 10k and wouldn't comment on the possibility of the 5k being included too. *Kenyan 5,000m And 10,000m Trials To Be At Prefontaine Classic This is big news. The details clearly aren't out, as Chris Solinsky is trying to figure out what it means for him (i.e., whether the races will be Kenyan only). More here. LRC Track Talk Live From Kenya Employee #1 has been in Kenya for 2 weeks, meeting with many of the sport's stars. In this 45-minute broadcast, get the inside scoop. Talk About A Comeback: Philip Mosima, Who Competed In 1988 Kenyan Olympic Trials As A 12-Year-Old, Is Trying To Make A Comeback At Kenyan XC Champs He ran 12:53 in 1996 when 12:53 was unbelievably fast. 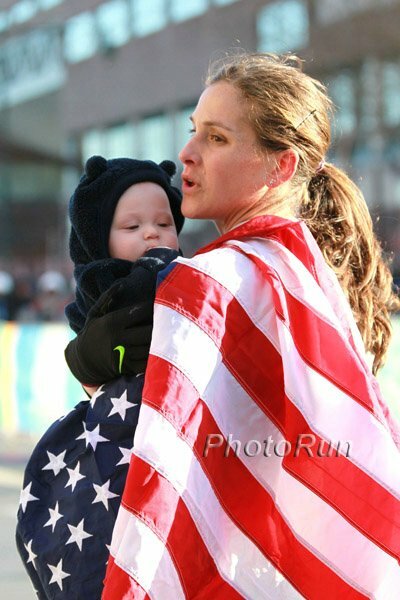 *Transcript Of Meb, Bob Larsen & Mary Wittenberg Teleconference (Word document) Meb reveals that his wife ran a 5k in 26:05, officially eliminating their children as #1 prospects for the class of 2030. *Denver Post Catches Up With Ritz, Who Is Excited To Get Back To The Track - Ritz: "I still think I'm one of the best runners in the world." *Ritz Blogs About His Recent Training: "I got out my spikes for the first time in two and a half years." 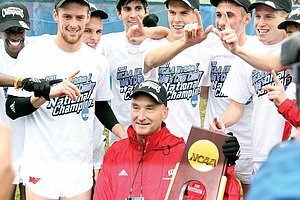 Recommended Read #1 5 Minutes With Southern Utah Coach Eric Houle - The Man Behind Cam Levins' (And Jess Baumgartner's Success) Learn from the man who designs the workouts for LRC sensation Cam Levins. Houle talks about training at 160 mpw and says that Cedar City, US is one of the hidden gems in terms of location in the US, as it's within a short drive of 10,000 and 2,000 feet of altitude. Recommended Read #2 Science Of Sport's Ross Tucker Looks At Alberto Contador, Lance Armstrong, Jan Ullrich & Oscar P Cases Says it's a shame so few people truly understand science. Even though Contador was banned for 2 years, he disagrees with their assertion that a blood transfusion was "very unlikely to have occurred." We also loved this quote: "The general public, and therefore the general media who cater to them, do not want to peel back layer after layer of scientific explanation to truly understand a case. They want simple answers, black and white, and science is incapable of providing them. PR, on the other hand, thrives on simple answers." Interesting Read Bloggers encourages track meets to be intimate affairs that "cater to a sophisticated, microbrew and/or wine drinking, nationalist" We agree that each track meet must be unique and specific to a particular audience if the sport is to survive and we also agree that each meet director needs to think about why he or she is putting on the meet. We don't understand why it starts with total vitriol for super-agent Ricky Simms. Want To Be A British Olympian? You Have To Agree To This Code Of Conduct: Selling official kit, criticising team-mates, betting on events and political tattoos are banned in Olympics 34-page code of conduct. 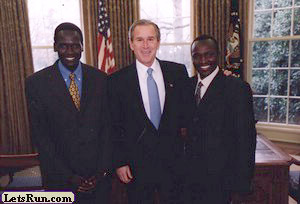 Brief Chat With Lawi Lalang After His 13:08.28 Collegiate 5k Record Talks about plans to go for the Kenyan Olympic Trials 5,000m, training with Bernard Lagat, and some ambitious goals which include sub-13 outdoors and a shot at either the mile or 3k collegiate record sometime in the next couple of weeks. Running Times Interview With Ricky Flynn Flynn ran 2:13:41 for 12th place in his debut marathon at the Olympic Trials and is the guy we noted as "least moving backwards over the last 5k." Some interesting talk about his move to high-volume training. Q&A With Canada's 2008 Olympian Taylor Milne, Who Is Trying To Qualify For The 2012 Games In The 1,500 Apparently he has "Beijing 2008" tattooed on his chest. Bernard Lagat Says He Wants To Run World Indoors And Would Like To See Galen Rupp There Too Also includes quotes from recent AR setters, Jillian Camarena-Williams and Jenn Suhr. Olympic 800m Champ Pamela Jelimo Sparks Back To Life In Lievin It was her first sub-2 since the Trials for the 2009 Berlin World Championships. Poland's Adam Kszczot Runs 1:44.57 And Moves To 3rd On World All-Time Indoor List Ethiopia's Mohamed Aman (the man who beat David Rudisha) was 5th in 1:46.80. Olympic bronze medallist Edwin Soi ran 7:32.56 for 3k to beat out 12:53 5k man and 20+-year-old Isiah Koech (7:32.89). Koech's time got him the world "junior" record. World indoor silver medallist Abdelaati Iguider won the 1,500 in a WLing 3:34.10. Mariem Alaoui-Selsouli ran 4:03.67 to win the 1,500 (Brit Steph Twell was ninth in 4:11.65). *National Records Go Down At Chinese Indoor Meet China's Zhang Jun set the Asian indoor shot put record at 20.16m and Xue Fei set a 1,500m NR at 4:09.71. 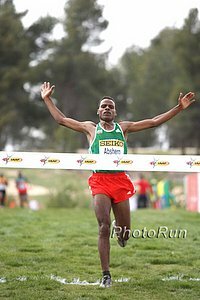 Bronze Medallist From 2010 World XC Juniors, Japheth Korir, Wins Luxembourg XC Meet - Canada's Reid Coolsaet Is 4th (43 Seconds Back) Ethiopia's Almensh Belete won the women's title. LRC: Lagat Smashes American Record, Collegiate Record Books Rewritten Bernard Lagat ran 13:07.15 and smashed Galen Rupp's American indoor record, but the most impressive achievements may have been the rewriting of the collegiate record books. Lawi Lalang (13:08) not only obliterated the old indoor record but he ran faster than Henry Rono's nearly 34-year-old outdoor record. Chris Derrick got beaten badly but becomes the 5th-fastest collegian in the US indoors or outdoors. In the Wanamaker mile, Matt Centrowitz reminded us why he won the bronze medal at Worlds and Miles Batty broke the collegiate record. NY Times: Centrowitz Makes It Look So Easy (3:53.92) - American, Collegiate & HS Records Fall In 5,000 Centrowitz is one of the world's best milers and he showed it on Saturday as he totally schooled the collegians who were lined up to challenge him, although the top collegian didn't care, as Miles Batty got the collegiate record with a 3:54.54. In the women's 1,500, world champ Jenny Simpson beat Shannon Rowbury as both ran 4:06. LaShawn Merritt came up way short of the WR in the 500. MB: Lagat AR (13:07) Lawi 2nd in 13:08 CR, Cheserek 13:57 and Derrick 13:19! LRC Boston Marathon Releases Elite Fields For 2012 2011 champs Geoffrey Mutai & Caroline Kilel will try to defend their titles against a field that includes 5 sub-2:05 and 2:23 competitors. Wejo Speaks: LRC What About The Sport? Wejo, an outspoken critic of Millrose Games moving to the Armory, says don't celebrate USATF sticking it to Millrose. Celebrate the sport being on ESPN. Recommended Read! The Ultimate Blue-Collar Runner: Meet Jimmy Grabow - The Guy With A Full-Time Job Who Ran 2:12:29 At The Trials In His First Marathon If this piece doesn't inspire you, then we don't know what will. The guy gets up every day at 5:30 and bangs out 15 miles + a core workout before going to a real 40-hour/week job before running 5 more miles after work. *MB: Jimmy Grabow - The Ultimate Blue Collar Runner Do you know about the blue collar or yuppie debate - it's one of the greatest in LRC history. 5 Minutes With Alissa McKaig She PRed by 5+ minutes to finish 8th at the OTrials in 2:31. *Interview With Jenny Simpson To Air On ESPN Radio Today Starts at 5:00 p.m. EST. Go here and click "Listen LIVE." Jenny will come on around 5:15. *Interesting Look At Running Siblings And How Coaches Deal With Their Different Levels Of Talent Looks specifically at Chris Derrick and his younger brother Mark, who even though he has a 9:14 3,200 PR, is still far under his brother's shadow. *Toni Reavis Blogs On "The Culture Of Running In East Africa"
*Tyson Gay Still A Threat To Jamaican Sprint Dominance Gay: "Last year, for me to run with basically one leg, I ran 9.7. I can be a lot more dangerous as long as I stay healthy." Big East Results Most of the conference meets are this weekend. *Tokyo University Hakone Ekiden CR Setters Kento Otsu & Yuta Shitara To Run NYC Half On Mar. 18th They have PRs of 1:02:35 and 1:02:43. *DI Rankings: Arkansas And Florida Still 1-2 For Men (Texas A&M Jumps From 8th To 3rd) Oregon still lead for the women; Clemson and LSU swap 2-3 positions. 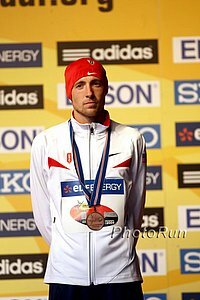 *Sydney Olympic 800m Champ Nils Schumann Under Investigation For Blood Doping Was among those named in German doping scandal. We Want Your Votes We've got roughly 20 pairs of Puma Faas shoes still to put to the test and we want your votes. Voting has been going on on the message boards, but here it is for everyone else. See the amazing entries from LRC nation. LRC 5 Thoughts On NBIGP, Patrick Makau Gets Beaten, Drug Talk, A Crazy Half Marathon In Japan And Minnesota Mid-D We give you more thoughts on the New Balance Indoor Grand Prix and tell you who really won the 800, then turn to the roads and talk about Patrick Makau getting beaten and a crazy half marathon in Japan, plus an update on Minnesota's great middle-d program, plus some training advice.